Armistice Day 2018 marks the 100th anniversary of the end of the war on 11 November 1918, after four years of brutal conflict. Fighting ceased at 11am, the eleventh hour of the eleventh day of the eleventh month. 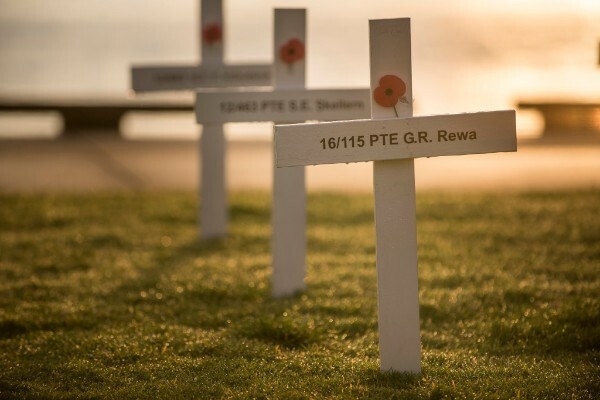 Join us as we commemorate Armistice Day at 11am on 11 November at Tauranga’s Memorial Park, with a minute silence, large-scale poppies painted by children from Tauranga and the Western Bay, and 109 white crosses honouring Tauranga’s fallen. Mayor Greg Brownless is looking forward to a moving commemoration at Memorial Park. “We remember our fallen and the centenary of the armistice that finally brought peace and I invite everyone to use this opportunity to connect with our own history,” Mr Brownless said. “We will join the nation-wide effort to recreate the roaring chorus that announced peace in 1918 by incorporating Dave Dobbyn’s song Welcome Home. “With 109 white crosses and 320 large-scale poppies we will set the scene for the service at the cenotaph and a whole day of remembrance for everyone to participate in. Groups wishing to march in the parade please assemble by 10.15am next to the Queen Elizabeth Youth Centre. If your organisation or group wants to lay a wreath during the service please email Kate Percy at armistice.day@tauranga.govt.nz. Wreath registration closes at 5pm on Thursday, 8 November. Wreaths laid during the service will be removed from the cenotaph at dusk on Armistice Day. The wreaths can be collected from the Tauranga RSA at 1237 Cameron Road, Greerton, until noon Tuesday, 13 November 2018. Wreaths not collected by noon on Tuesday, 13 November 2018 will be disposed of. A free park and ride service, proudly supported by Bay of Plenty Regional Council, will be available from Tauranga Boys’ College to Memorial Park at 9.30am, from Mount RSA at 10am and Tauranga RSA at 10.15am with buses returning immediately after the service. Car parking will be available at the Tauranga Boys’ College car park off Devonport Road (between Thirteenth and Fourteenth Avenues). There is no additional car parking at Memorial Park. Car parking for mobility card holders only will be available outside the Queen Elizabeth Youth Centre. Road closures will be in place on Fraser Street between Eleventh and Thirteenth Avenues and on Eleventh Avenue between Fraser Street and Devonport Road (including the roundabouts) from 9am to 2pm on Sunday, 11 November 2018. The service will go ahead rain or shine. We strongly recommend to bring water with you, wear a hat and apply sunscreen.